Preservationists be happy - the TTC is looking to the past in its ongoing overhaul of several damaged and dust-covered subway interiors. Whether intentional or not, the new reflective galvanized metal wall panels at St. Andrew station, roughly a third of which are installed, hark back to a time when many of Toronto's stations were decorated in glassy coloured tile. The TTC covered the original vitreous marble wall panels at St. Andrew and Osgoode stations when water damage caused the brittle tiles to warp and break. As photos show, the present vertical strips of plastic - also a feature of Kipling, Kennedy, Sheppard-Yonge, and Finch stations - simply cover the original pockmarked and dusty walls. The original tiles at every station from Union to Davisville were either knocked out or covered over in the 70s and 80s. Eglinton, trivia lovers, is the only stop to retain some of its original glossy aesthetic at track level. "The real challenge in dealing with subway stations is brake dust," says TTC spokesman Brad Ross. 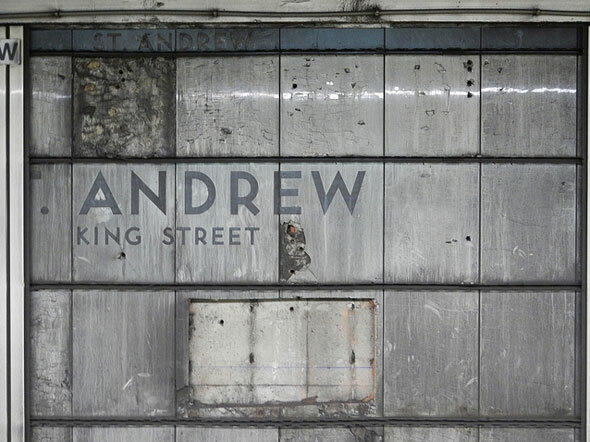 "The wall panels, the slats, [at St. Andrew] had deteriorated. They were stained, they were damaged, very labour intensive to keep clean and maintain so they're being replaced with this new panel." The $275,000 cost of the new wall treatment, which doesn't include the tile in the ticket hall or on the platform, came out of the TTC's annual maintenance budget. Osgoode, St. Patrick, Queen's Park, York Mills, Kipling, and Finch stations are also scheduled to get the same treatment in the next few years. At St. Patrick and Queen's Park, water damage has damaged the current wall covers, which replaced the original 1960s tile, beyond repair and is negatively impacting the stations' appearance, the TTC says. An earlier test of new wall panels at St. Andrew was undertaken in 2009, but these metal panels are more resilient than the earlier version used. What do you think of the new look at St. Andrew? Are you pleased to see the tired wall slats banished for good? 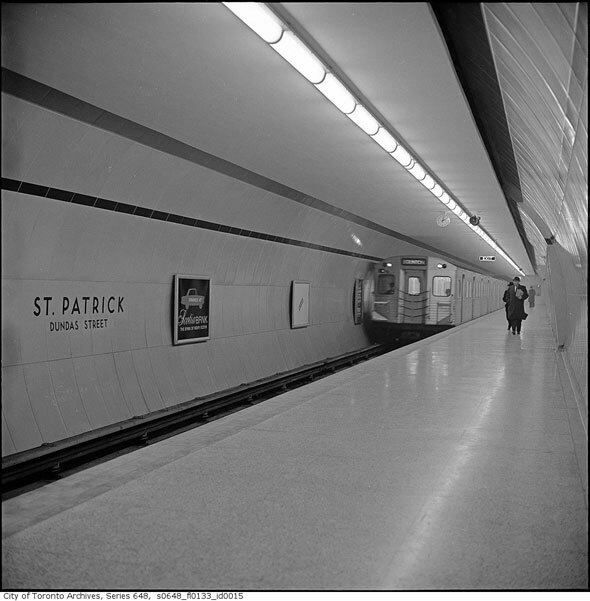 Will you miss St. Patrick's current neon green interior?